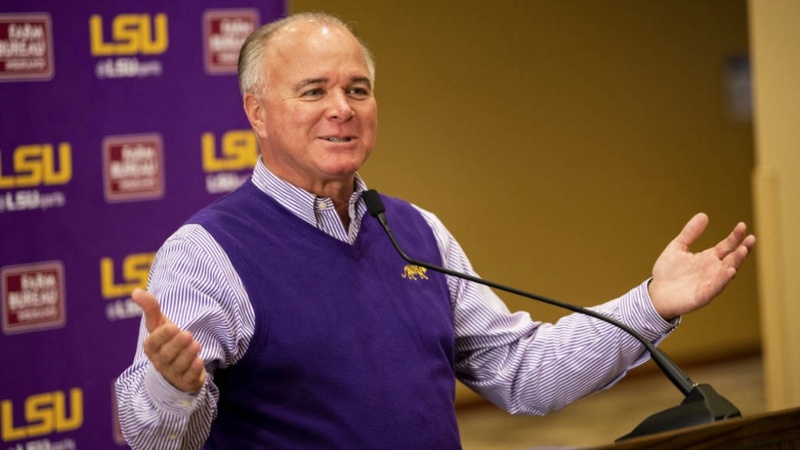 It should have come as no surprise that LSU baseball coach Paul Mainieri exhibited no concern about his team being ranked No. 1 in the country in three preseason polls. Preparing for his 13th season as the lead man in the Tigers program, Mainieri would rather have his squad ranked at the top than at any other place. “I’m glad we are No. 1,” said Mainieri at LSU Baseball Media Day on Friday afternoon. “Expectations are always high at LSU. What difference does it make it you are fifth, sixth, seventh, second? Coming off a somewhat subpar season and a fall where we did not do everything like normal, being No. 1 is good. LSU’s 2018 season ended in the Corvallis (Ore.) Regional where it lost to eventual national champion Oregon State in the finals. There was no June baseball at The Box for the Tigers, who finished with a 39-27 record. LSU was 15-15 in Southeastern Conference games. The Tigers return five everyday starters – second baseman Brandt Broussard, shortstop Hal Hughes and outfielders Antoine Duplantis, Zach Watson and Daniel Cabrera. LSU lost only three pitchers who contributed a year ago – Austin Bain, Nick Bush and Cam Sanders. Duplantis, Watson and pitcher Zack Hess all chose another year in school over beginning their professional careers. Moreover, shortstop Josh Smith and pitcher Eric Walker will be back after injuries. Smith played in only six games due to a back injury. Walker was out all year after Tommy John surgery. “What a difference it is to have (Duplantis, Watson and Hess),” Mainieri said. “You feel their leadership. Those guys know how it works. It was just like two years ago when Jared Poche, Greg Deichmann, Kramer Robertson and Cole Freeman came back. We came within a hair of winning the national title. Hess and Walker will be two of LSU’s weekend starters. A true freshman will hold down the other spot in the weekend rotation. Landon Marceaux has an edge over Jaden Hill, Chase Costello and Cole Henry as practice begins. Injuries were a problem for the Tigers pitching staff during fall practice. Only four pitchers are unavailable at this time – Nick Storz, Easton McMurray, AJ Labas and Ma’Khail Hilliard. Of this group, Mainieri feels that Hilliard will be back in a short period of time. “Ma’Khail had a sore shoulder in the fall,” Mainieri said. “He threw the other day and there was soreness again. We are hoping it is just a muscle strain. We will shut him down for a week. Storz had surgery at the beginning of the fall. We found out he had a torn lat muscle. Mainieri is worried about just one position – catcher. Saul Garza, a junior college transfer, was projected to be the No. 1 catcher. He suffered a knee injury in the fall and will be not able to catch until late March. Brock Mathis, also a junior college transfer, is now the starting catcher. “Saul is the only position player with an injury situation,” Mainieri said. “He was catching really well in the fall. He went to block a ball in the dirt and shook his knee. It turned out he had a torn meniscus from a past injury. Saul had a four-month rehab. With Smith back at shortstop, Hughes will move to third base. Broussard will start the season at second base. First base will be a competition among four true freshmen – Cade Beloso, CJ Willis, Drew Bianco and Gavin Dugas. In high school, Willis was a catcher and Bianco and Dugas were shortstops. The outfield is set with Cabrera in leftfield, Watson in centerfield and Duplantis in rightfield. True freshman Giovanni DiGiacomo will receive significant playing time as the fourth outfielder.